Armaid was designed by Sports Injury Therapist, Terry Cross after he got arm and elbow tendinitis himself from working on the hard, tight, overused muscles of athletes. He saw there was no good tool or method on the market for people to help themselves for the millions of sufferers without hope. So the therapist became an inventor to create the simplest and best tool design in order to apply that one technique. Armaid was born. An Award Winner that had been on the market since 1999. A revolutionary simple cost-effective device designed to keep your arms hands wrists elbows and triceps in their best working condition. This self-care self-regulated device will gives you the ability to do 3 professional massage techniques which can rapidly help relieve and prevent arm and hand problems. This is a Professional Grade device and it requires your active participation for outstanding results. One-on-one counseling available and responsive customer support. 10-year Unconditional Warranty. 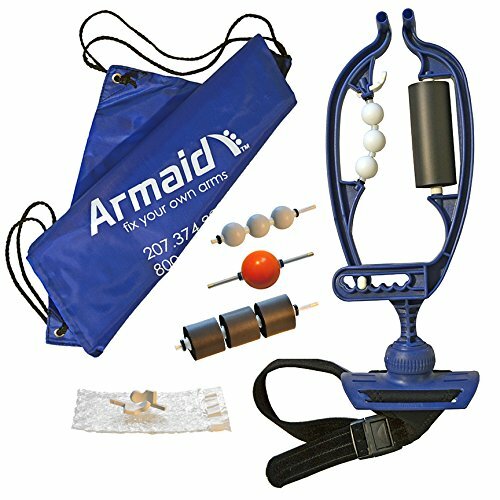 ARMAID COMPLETE - This Package includes the Original Armaid, White Roller, Grey Roller, Orange Roller, Black Roller, Travel Bag, Permanent Support Roller, Neoprene Leg Strap, 3 Tabs, DVD and Handle Fastener. Portable weighs 1 pound. Use Anytime, Anywhere you need relief. Designed by Sports Injury Therapist; endorsed by Medical Doctors and Physical Therapists. Join over 30,000 Armaid users worldwide who've made this their personal whole arm therapy tool to maintain their own arm health. The Armaid lever design adjusts easily to any size arm to deliver as much pressure as you need without fatigue. With total 4 optional attachments available that helps a wide range of problems in your forearm, wrist, hand, thumb & elbow. Relief of: Tennis Elbow (codo de tenista), Golfers Elbow (Epicondylitus, Carpal Tunnel Syndrome, Repetitive Strain Injury (RSI), Overexertion Injury, Cubital and Radial Tunnel Syndrome, de Quervains Tenosynovitus/Syndrome, and scarring from injuries or surgeries.